After receiving lots of feedback from sellers asking “why can’t i sell juice plus, i am not making money” we thought we would try and give you the best juice plus selling techniques we know and try and help you understand where your juice plus selling techniques are going wrong. So you have bought in to the franchise, and you are just struggling so hard to make sales and starting to think its a scam…is it? we have a guide on this already which you can see by clicking here so we wont go in to much detail on this page, but to be brief. MLM is & isn’t a scam, the problem is that it only works for 95% of the people involved and the trick is becoming that 5%. The 5% that make the money, make their money from the other 95% who fail, that is a key point to remember. Q – I am really struggling to sell the product to anyone? This is the biggest problem people face, the chances you have joined the team far too late now and everyone in your area has already been annoyed on social media networks and you have just become another annoying person on facebook. imagine setting up a hot dog stall next to 10 other hot dog stalls, you can’t build up a reputation because all the others have it, there is 10 other people to compete with and this is the problem and this is where you need to evaluate your juice plus selling techniques. So what do you do – You have to think outside the box and by doing what everyone else is doing is going to lead you to ultimate failure as you have just become part of the hurd. Don’t advertise on social media as this has already been exhausted. You have to find a new breed of customer, set up a stall at a car boot sale, offer free samples, invest a little money in to small bottles and labels with your name on them and hand them out outside a supermarket, visit local companies and ask to set up a stall inside their canteen, give people a 1-2-1 interaction as opposed to social media. you really have to set yourself aside from the rest because following a flock of sheep is only going to lead you to the same destination as them and you have to remember that social media is meant for social media. people do not log on to flocked with annoying advertisements. you are ultimately trying to sell hot dogs outside a restaurant…. but what you need to do is move your hot dog stall to outside a sports centre. Q – My rep is giving me no support and tells me its possible because she’s making money from it? Firstly you have to remember the main point of a MLM scheme, is that the only reason people sign up to it is to make money, and reps are only interested in signing you up so that they make money. The chances are they are not making as much as you think they will soon go quiet when you ask them for a screenshot of their earnings. but dont let this put you off as you can be smarter than them by using this website. Q – I am struggling to recruit people? This is likely to be down to the fact they dont believe the rubbish you are told to tell them and rightly so…. juice plus selling techniques are told to make out you are rich, and that the product is doing wonders for you in brief terms. But how believable is this really…. do you seen bill gates making out he is a millionaire, no, and why? because he doesn’t need too, although it pays to exaggerate your life style at first you will find your recruits wont be long term as there expectations are just not met. Q – What type of distributor should i recruit? The wholesaler – this is the individual who isn’t interesting in selling products to one person but wants to buy big and sell big, whilst these only make up 5-10% they still are registered technically as distributor’s, these are generally those who like to buy big to save money. And they could simply be placing large orders to themselves and taking the commission back as their discount on the large purchase. 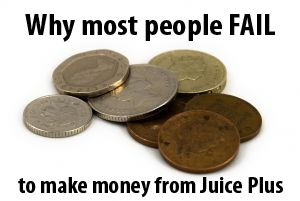 Most companies discourage this as it floods the online market with the product and in particular juice plus do not encourage this, however there is nothing stopping someone selling their products on amazon especially if they use a different name. The next is the Active consumer and makes up around 30-40% of the distributor network. These are those who are more motivated on referrals and chances are they are trying to sell juice plus to their friends and family. Then we have the Part time warriors – these are those that are building the business on a weekend or at night and although they have high aspirations of a 6 figure income and giving it large all over social media the chances are they are more than content with an extra 5-1000$ in their pay packet. These are also likely to be the ones pestering friends and family to buy the product and also are likely using it them self aswell and showcasing there results.